For Sale on Ravelry and my Etsy shop. Feeling lazy? Ready-made frogs are also available on Etsy. I will now eat caramels (from here) to celebrate. This entry was posted in Yarn Miracle and tagged frog prince, knitting, my patterns, shop, toy on January 28, 2010 by emily. One of the things lost to Project Eat with Kindness was my favorite chili. Before anyone gets too excited, it was made from a mix (oh the shame). It was a mix that came in a little yellow envelope and contained beef bouillon so I couldn’t just drop the hamburger. It’s not gourmet, it’s not from scratch (I have another recipe for that), it’s just an easy chili for chili dogs or chili cheese fries or in a bowl with a grilled cheese on a cold evening. Wipe your tears away, I’ve recreated it. Close enough that I don’t miss it anyway. Awesome Yellow Pot is not required. Throw it all in a pot and bring it to a boil. Then reduce the heat and simmer for 20-30 minutes. Nothing to it. Enjoy with corn bread, sour cream, cheddar on top, on a veggie dog, or (my personal favorite) dump it over homemade fries* and add a little shredded cheddar. *Slice a potato into fry shapes, toss them in canola and garlic salt, spread on a cookie sheet and bake at 425 for about 22 minutes. This entry was posted in Yarn Miracle and tagged chili, recipe, three bean chili on January 26, 2010 by emily. CounterPain Squares are going well. Or they were until a lightning strike took out the DSL modem, the gate, the dryer, the telephone (the actual phone, a cordless so the base was plugged in, not the phone line), threw a bunch of circuit breakers and knocked a nice hole in the siding on its way out of the house. That was Completely Crazy and Unnerving. The internets are back, so depending on my Hulu queue, square knitting may resume in the morning. This entry was posted in Yarn Miracle and tagged counterpain, hulu, lightening strike on January 22, 2010 by emily. You can’t judge a book. The Frog Prince is a pretty good toddler lesson for Martin Luther King’s birthday. The Frog Prince is my new pattern and he’s ready for test knitting. **I’ve got my Lovely Volunteers! ** Thank you so much for the speedy responses! The Frog Prince Prototype is endorsed by tiny princesses who won’t wear their hair clips. Frogs come in all colors. This one’s poisonous. 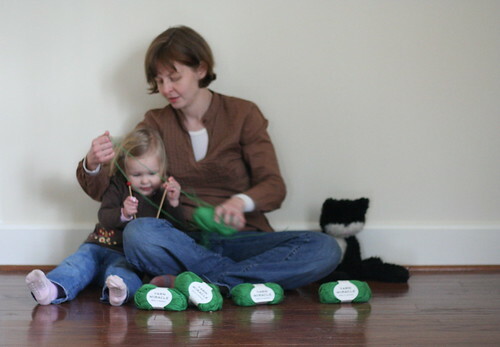 This entry was posted in Yarn Miracle and tagged frog prince, MLK, my patterns on January 18, 2010 by emily. With special guest star Ellie Peg as Goldilocks. I made an expansion pack for her dollhouse. Next is Great Gran and the Big Bad Wolf. This entry was posted in Yarn Miracle and tagged craft, kid, peg dolls, three bears on January 16, 2010 by emily. I don’t just want to replace the butter with some kind of butter substitute. For one thing, most margarines still contain dairy and for another, most of margarines have whatever kind of hydrogenated is bad for humanity. I want to add recipes to my repertoire that don’t rely on dairy at all. That means vegan. Stay with me here: if there wasn’t vegan food that tasted good, only true martyrs would stay vegan very long. So I checked Veganomicon out of my library. * And then I made Chewy Chocolate Raspberry Cookies. Try them. You’ll be shocked by the dense chocolaty goodness. SHOCKED. The dough is really thick, so you either need some upper body strength or willing toddler hands to get it all combined. Then we used the scoop and smush method (medium ice cream scoop and the bottom of a glass) to arrange them on a parchment lined baking sheet. They don’t spread much so you can do a lot at one time. Ellie sprinkled kosher salt on top. If you missed it: chocolate requires salt. Bake them 10 minutes. They’ll get dry and cracked on top. If you don’t want oval cookies, wait a minute before you move them to a cooling rack. They taste just as good oval. Next, eat them all in two days. Ellie and I did this and we are not ashamed. If you want to negate the lack of dairy: 2 cookies + microwave for 12 seconds + vanilla ice cream = swoon. The goal for 2010 is to reduce, not eliminate. *I am just as surprised as you are. And it was at my personal branch. This entry was posted in Yarn Miracle and tagged chewy chocolate raspberry cookies, cookies, recipe on January 13, 2010 by emily. Bones is working well as CounterPain Company. I am trying two new things with the blog. 1) Cropping my pictures larger – please let me know if it is messing up the appearance when you visit Yarn Miracle. 2) Shorter, more frequent entries. Let’s see if “pithy” as a theme for 2010 makes me post more often. This entry was posted in Yarn Miracle and tagged blog changes, counterpain on January 9, 2010 by emily. The good sunlight was gone by the time we made it upstairs, but you get what you get and I used what I got to make the new banner. Consider it a place holder – we’ll try again on a sunnier (and more cooperative) day. This entry was posted in Yarn Miracle and tagged banner change, ellieivey, outtakes on January 9, 2010 by emily.